Scandinavian Web firm Opera Software has announced the release of its Opera 12 browser in beta today, extending the range, which it says is used by 250 million people across computers, mobile phones, TVs and other connected devices. The new release, codenamed ‘Wahoo’, has a number of improvements including, most notably, themes for browsers that allows users to customise the background image that accompany them round as they navigate the Worldwide Web. The new addition also brings a new reading functionality that lays pages out “like a book” and auto adjusts them to the viewing screen size to allow an optimised reading experience. The technology comes from Opera Reader, a former project that enabled ‘native page’ layout. Another, but more gratuitous addition, allows photo addicts using Opera 12 to take self-portraits with breaking sweat. The browser has integrates photo services, like Photo Booth and Polaroid, which can be used to take photos via a computer’s Web-cam direct from the Opera 12 browser. The firm has addresses the problem of crashed plug-ins bothering users too. Opera 12 plug-ins now have their process which, the firm says, means that “when a plug-in crashes, it doesn’t take Opera down with it.” Nice. New Opera releases always add speed in addition to stability and, to that point, version 12 is nipper thanks to further optimization of the network SSL. Equally, improved tab loading times help speed up opening and closing of tabs and the browser itself, the firm says. Other additions include a push for users in the Middle East with four new languages (Arabic, Farsi, Urdu and Hebrew), 64-bit versions for Mac and Windows, HTML5 drag and drop and CSS3 animations and transitions. Lie also emphasises the push on increasing features for developers, calling Opera 12 “a platform to build upon”. “We’re excited to share it with the world and see what people can create,” he concludes. 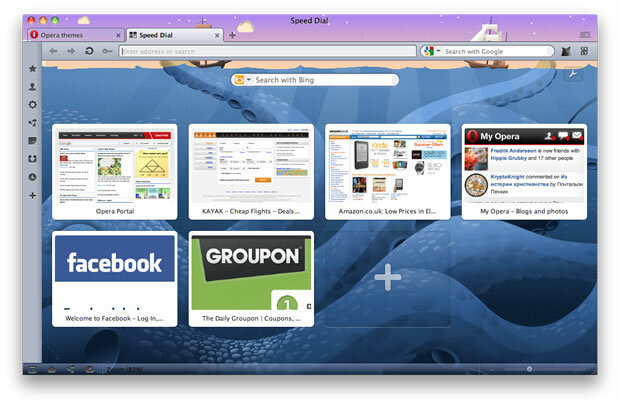 Firefox 12’s beta unveiling comes two days after Mozilla rolled out Firefox 12, and follows updates to Opera’s other platforms this year. The firm unveiled its TV app store in January, Opera Mobile 12 arrived in February and Opera Mini 7 launched on Android in March.